Well, this is the hard one... It's tricky to tell the actual weight of the frame because of differences between model years, sizes and even individual frames, but expect something between 9.5 and 9.9 lbs (4300-4500 g) without rear shock for the latest model. What is quite unusual, is that BB7's frond end is made of aluminum (6061 T6) while the swingarm is Cr-Mo (4130) steel. Why? You can read it in "Frame oveview" section. 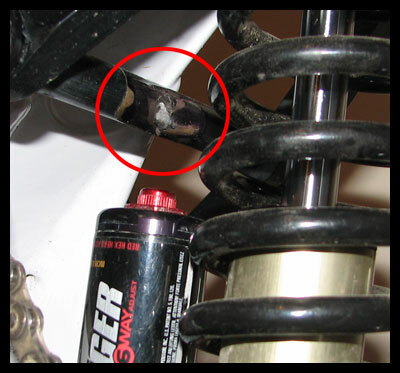 Suspension travel - 228 mm - 9"
Stock BB7's was equipped with FOX Vanilla RC or Progressive Suspension 5th Element (see problem note below). BB7 has ISCG chain guide mounting. As a rule of thumb, thin-plate, single roller chain guides works best. Roller should be positioned about 9 o'clock, while chain should go directly from chainring to frame pulley. Also the BB7 swing arm, in its original form will accept very big tires. However, the chain device will bring down tire clearance. This can be solved by choosing thin-plated devices or using washers to get the backplate out far enough. E.13 provide guide how to mount their SRS on BB7: click to read - it can be useful for other devices, too. 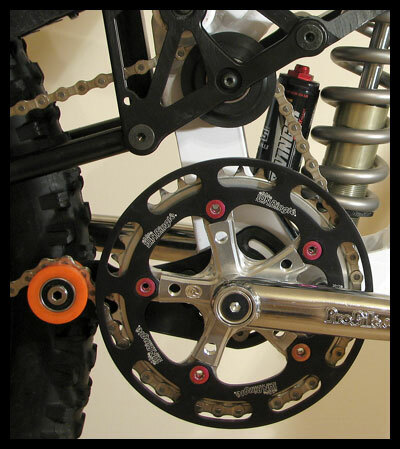 Once your BB width is found and your crank set and chain device are installed, you should find a good chain line over the BALFA pulley. It's possible to fine tune the chain line by spacing the pulley from the linkg plate. As said above, swing arm provides great clearance, up to 75 mm width (approx. 2.8" tires), so the actual clearance depends on chain device of your choice. Some Chain guides may bring it down to about 2.3", but if you choose any device with flat inner side of the plate, you shouldn't have problems with tires around 2.5". Old MRP World Cup System 1 (and similar) should work best. Before replacing your bearings it's highly recommended to read this great BB7 pulley and pivot bearings replacement tutorial written by Jeffrey Nelson. 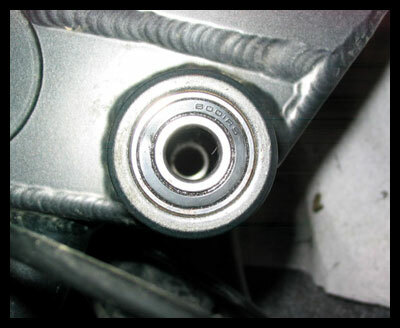 Your seat post should be inserted in the seat tube with a minimum of 80 mm (3 inches) of the seat post into the seat tube. Also you have to remember that you need about 80-100 mm (3-4 inches) of seatpost extended above seat collar (you can't completely drop the seat) to leave place for rear wheel when suspension compresses. It really depends on your frame size, seat and seatpost type, so it must be checked before first ride if you want your seat the lowest possible. When setting up your BB7, you will probably need to add a few links to your chain. The unusual chain route requires a longer chain than normal. Make sure your chain is long enough to reach all gears while not pulling too much on the derailleur when the suspension is activated. 6 or 7 extra links are usually enough, but your chain ring size and cassette gearing can make it change. Stock chain (114 links) *should* be long enough for 36T (chainring) and road casette combo. 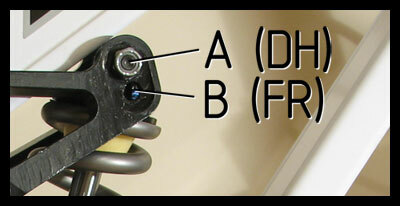 lower mount - the floating effect of the brake is decreased.